Note: I received a copy for review from the publisher via NetGalley. My copy did not include the manuscript reproduction pages for the illustrations, therefore I cannot comment on the images or their quality. The book gives the historical background of the Splendor Solis and then a new English translation of the Harley manuscript 3469 version, currently held by the British Library (and viewable online here. Click on the image below ‘view bindings’ to see the pages). There is an introduction and four chapters, followed by a glossary of alchemical terms and other alchemical works the Splendor Solis refers to. The chapters are: History and authorship of Splendor Solis, Inventing an alchemical adept: Splendor Solis and the Paracelsian movement, Commentary on the text and plates of Splendor Solis and finally Translation of the Harley manuscript. The chapter on the history of the manuscript is very scholarly and quite dry. I appreciated that Prinke mentioned the history of scholarship regarding the Splendor Solis, in terms of printed volumes, manuscripts, the illustrations and attempts at discovering the author and illustrators. He even includes recent scholarship on the topics. I was disappointed that there was such a limited discussion on the antecedents of the artworks, the topic that most interested me. Instead of showing examples of where the Splendor Solis’ illustrators received inspiration, he simply offhandedly mentioned the works with little to go in if you’d like to research this topic yourself. When discussing the Aurora Consurgens’s artistic lending he merely cites the page of an English translation that got a 200 copy print run in 2011 and is quite difficult to find. I did find an older reproduction of the Aurora Consurgens online (digitized by Zurich’s Zentralbibliothek), but Prinke gave so little descriptive information that I found it difficult to identify which images he was comparing. I really enjoyed the essay on the Paracelsian movement. There was a lot of information here I was unaware of and it was fascinating to learn about. The next chapter summarizes all of the passages in the manuscript and gives a thorough description of the illustrations and their meanings. It is here that the reproduced manuscript pages are found. The information is in clear language with translations of any text that appears in the images. I was a little surprised there was a summary of the text followed by a full translation, but the translation’s fairly dense, so it’s actually quite useful to have read the summary and explanation before digging into it. It meant I came away with a much better understanding of what I read. As stated above, I can’t judge the quality of the images included in this edition, but the text alone is definitely worth the price. 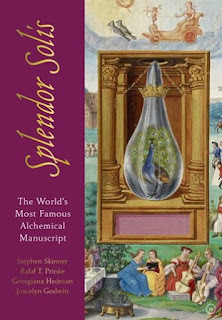 It’s a deep dive into the Splendor Solis and a worthwhile addition to your collection if you’re interested in alchemy.